Do You Fear or Trust? Terrorist attacks. Political division. Economic uncertainty. Fear of family instability heading into the holidays. Increased health issues with test results that indicate major changes are ahead. Each day seems to bring a new reason for seeds of fear to grow in our minds and hearts. How can we manage our lives when there are so many reasons to fear the present and the future? A common acronym for FEAR is False Evidence Appearing Real. We can fall prey to believing the false evidence—the lies—instead of pursuing the truth in a situation. Fear leads us to react first and ask questions later; it binds the heart and mind to a prison of “what ifs” that may or may not happen. These questions can plague us, leaving us ineffective in our daily lives. We can shrink back with timidity, afraid of any positive or negative results, becoming powerless over the fear. In my devotional book, The Grace Impact, the disciple Peter is described as one who overcame fear. He said to Jesus that he would stay with him, yet fell asleep when Jesus prayed in the garden and later denied knowing him. Later, after the resurrection, Jesus appeared to the disciples in the upper room, dispelling fear. Peter still felt guilt until Jesus looked right him in the eyes and forgave him by the sea of Galilee; his burdened heart felt instant relief. Empowered by his encounter with the risen Lord, Peter was transformed from fearful to bold by the impact of God’s grace. He went on to live a life of power, love, and self-discipline. Peter grew in grace and commands us to do the same. Like Peter, we need boldness in our personal faith, an attitude of courage and a desire to live openly for Jesus. Powerlessness and timidity lead to fearfulness. The spirit of timidity equates to cowardice — which does not come from the Lord. It is easy to let our internal conversation talk us out of doing something bold or difficult. We prefer to stay where things are safe and predictable. However, when we step out in faith, we can trust God because we have the promise that He is with us. God’s grace is at work, and we are reminded to look to Him for our confidence. Three things are promised to help us face our fears—power, love, and self-discipline. We are promised a spirit of power. The Greek word for power is dunamis, the same word from which we derive dynamite. This supernatural power is not a scary explosive. It is the confidence that permits the believer to go forward when the natural reaction is to withdraw. God’s power is available to us through prayer. The communication line with the heavenly Father is open if we are willing to use it. The Holy Spirit gives us the confidence to speak up or to take a stand for faith. Other times He calms us down when life is out of control. By God’s grace we have access to His power. We are promised agape — the highest form of love. This love, the first fruit of the Spirit, comes from God and puts others first. It is self-giving love, not the self-pitying mindset of a victim. We have the promise that perfect love casts out fear. (1 John 4:18) We rely on God’s power to show His love to us in difficult situations. God’s love has led me to love someone when I would rather not. This supernatural love has stirred compassion in my heart where once there was suspicion. When we turn to God, His divine love carries on even when our love runs out. We are promised a spirit of self-discipline. This is a person with a sound mind that remains calm and uses wise judgment. Whether it’s dealing with fussy children or a difficult individual at work, remember to remain levelheaded and composed. The spirit of self-discipline can curb potentially harmful words. Before reacting to a stressful situation, prayerfully consider your actions. God gives us sound judgment when we turn to Him. The next time you feel timid, fearful, or powerless, remember Peter’s transformation from timid to bold. 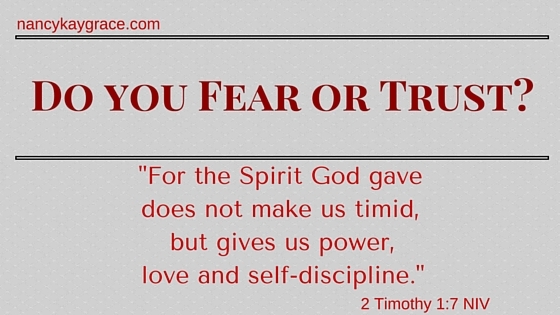 Read the promise of 2 Timothy 1:7 for power, love, and self-discipline. This verse brings hope to live with confidence and courage. Through the impact of God’s grace on our lives, our faith can be courageous, loving, and steadfastly committed to obeying Christ. Look to the Lord instead of the fear. He acknowledged fear and focused on the One bigger than the problem. He faced the fear and moved forward. In the face of danger we can represent the Lord through overcoming our fears and bringing hope right into our situation no matter where we are. Even in fearful situations, there is strength to press on. Fear does not need to paralyze us. God is bigger than the situations and has promised His presence with us. He is Immanuel, the God who is WITH us. When fear comes, we have a choice: we can face it down or yield to it. By facing it down, I mean to identify it, see what causes it, and what to do about it with the strength of God. (Read Shred Your Fear). We can bow our hearts to the Lord, knowing that the Lord is with us always, no matter what. These passages show us to trust the Lord when facing fears. If we choose to yield to fear, we bow our knee to the enemy of our souls, who does not want us to trust the Lord. Choose trusting the Lord over fear of a situation. Embrace faith instead of fear.